Superior hydraulics feature in all Sunset pool renovations and are present as standard in every new Sunset designer pool. Quality 50mm piping (as opposed to 40mm piping), plus high performance pumps and filtration are among the hydraulic components that contribute to the Sunset Standard. In this example Sunset’s sophisticated hydraulic design was particularly critical as the majority of the piping is integrated within the new home’s structure. Water filtration plus intake and return piping to and from the rooftop solar heating array was deliberately designed to run silent. This attribute ensures the residence’s occupants are never disturbed by the sound of circulating water, whilst preserving the architect’s (and homeowner’s) desire for an uncluttered contemporary exterior. 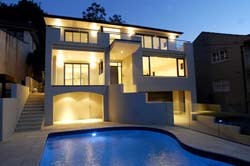 You can call Sunset pools on 1300 000 412 to discover how pool design details. 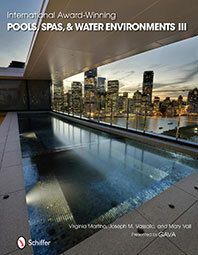 that you may not easily see, make a real difference to your enjoyment of pool ownership. Alternatively complete the enquiry form right now. This refurbished pool’s colour matched ceramic mosaic tiles and Sunset ‘Samoan Blue’ interior match, reflect and complete this new residence’s unobstructed northerly vistas and stunning water views. The athletic appeal and outlook from this Sydney home’s leisure and entertaining areas is equalled only by Sunset Pools’ concealed design elements that have been cleverly hidden from view. Among the many aspects that can’t be seen was the sites steep and narrow access that mandated that some extremities of the building’s ground floor could not be built until all major pool refurbishment work was completed. Additionally the integration of the pool’s hydraulics within the new home’s walls required constant consultation and coordination with the builders and engineers. This constructive liaison resulted in a number of variations to Sunset’s original contract, the consequence of which were cost savings for the new home and pool owner. Sunset has an acknowledged record of eliminating all unjustified expenditure when ever possible as well as redeeming every construction advantage that they can without compromising build or finish quality, and reducing project costs for their clients. Intake and return piping to and from the ‘Sunbather’ solar heating was routed through the building structure, passing through the walls of the garage, living room and kitchen before merging with water filtration conduits that enter and leave via the ground floor laundry. Being part of the dwelling it was desirable that Sunsets’ high volume smart hydraulics were designed to operate reliably and silently. Using high-spec (Class 18) PVC pipe and fittings, every join and junction was cold sealed to eliminate the possibility of air or water leaks. In preference to a reliance on gravity, the solar return pipe is acoustically insulated and has pressure valves fitted to eliminate water falling in a cascade from the roof. This smart hydraulic solution reduces the possibility of bubbles forming and eliminates the invasive sound of rushing water resonating though the building’s core. A Sunset Pool renovation is specifically created to be far more efficient and require less effort and power to own and operate for many years to come. In fact, there are sound financial and environmental arguments that advocate updating inefficient and environmentally unfriendly hydraulics with 50mm piping, high performance pumps and filtration to bring you existing pool up to the Sunset Standard. Having total confidence in your pool renovator’s informed selection of the most efficient water filtration, pool heating, lighting and sanitation systems is key when you’re selecting the most appropriate Sydney contractor. Sunset has an uncompromised approach to the replacement equipment installed on revitalised swimming pools and spas, to make certain of your refurbished pool’s long term viability. Methodical preparation, repairing faults often deep within the concrete shell and surface restoration are prerequisites of every high quality Sunset finish. In addition to award winning finishes that can be appreciated on the surface, Sunset Pools Renovations set the standard by incorporating upgraded filtration, pool heating, lighting and water management systems. Sunset’s awarded record stands as testament to their unequalled commitment to conceive and create affordable swimming pool and spa refurbishments, designed, constructed and finished to the highest standard. 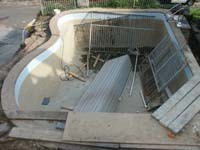 Sunset Pool Renovations continues to fulfil the wishes of their most discerning customers and will ensure that the pool site is spotless prior to completion and commissioning your refurbished swimming pool. commercial and government clients. Accurate estimating, sound administration, safe work practices and possessing all the required professional licences and appropriate insurances are attributes Sunset are well known for. At the end of the day, you can rely on Sunset for the pool that literally reflects your individual needs in award winning style. Discover what Sunset can achieve for you and how any aging swimming pool can be transformed into a sparkling contemporary feature of your remodelled modern home. 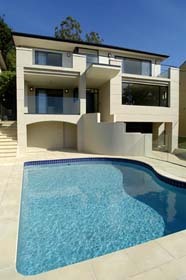 Call Sunset Pool Renovations on 1300 000 412 today or complete the on line enquiry form.